As Christmas approaches, people are desperately searching for perfect gifts for their relatives, friends, and colleagues. Consumers surf the Internet in an attempt to find the ultimate Christmas gift list for anyone. Still, such a list can be of little help since tastes differ. Magento retailers can assist their customers in solving this problem. 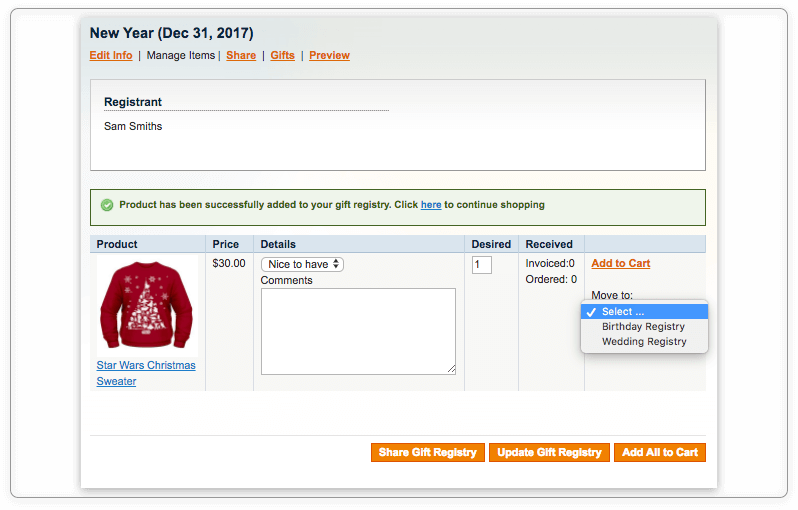 Gift Registry, a Magento 1 extension, allows shoppers to create multiple gift registries and share them with others to eliminate the exhausting guesswork. This tutorial describes how the module works in detail. 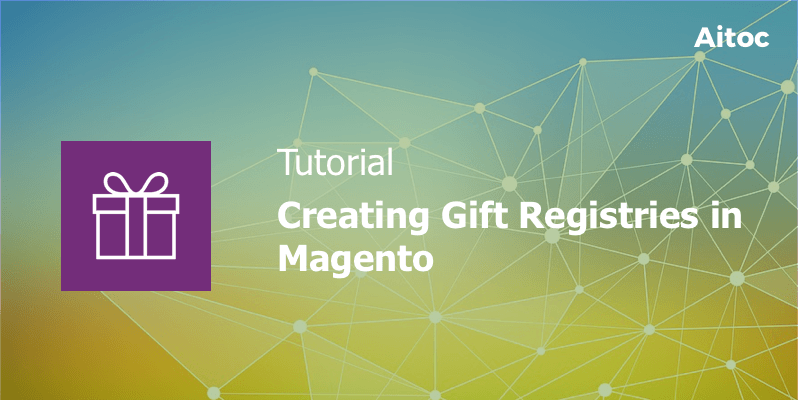 Navigate to System > Configuration > Customers > Gift Registry in the admin panel of your Magento 1 installation to configure the module. In the General Options section, enable the gift registry at your store by selecting the ‘Yes’ option in the ‘Enabled’ field. If you want to let shoppers know that they are going to purchase more items that the gift registry’s owner wants, set the ‘Quantity warnings’ field to ‘Yes’. On the front-end, customers will be shown a warning message each time such an event takes place. Access the ‘Scope’ field to manage your website preferences for the gift registry. You can limit the registry usage to the website level by choosing the ‘Website’ option in this field. Set the ‘Scope’ to ‘Global’ to allow clients to add products from different sites under the same Magento installation to one registry. Feel free to add an additional layer of security to gift registries by utilizing the secure connection. You can also choose different display options for invoiced items. 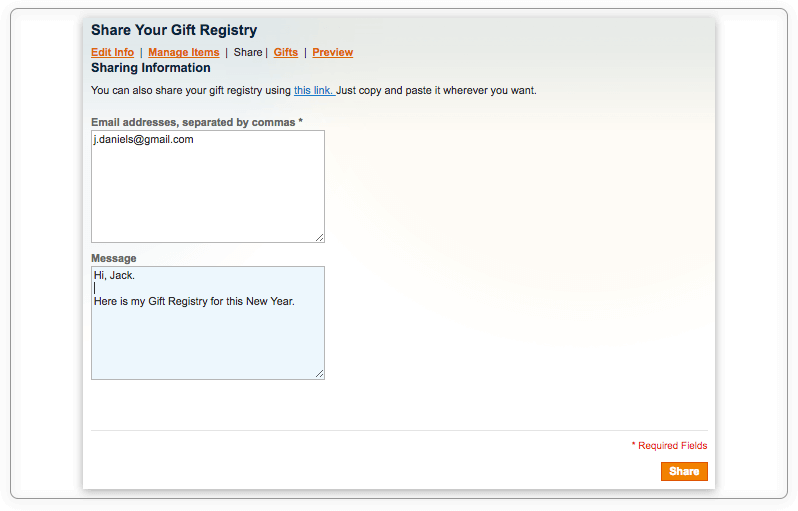 With Magento Gift Registry, you can give shoppers an opportunity to hide their registries from others. Select ‘Yes’ in the ‘Enable private status selection’ field to activate this option. You can also enable password protection of registries in the last field of this section. Go to the ‘Email options’ section to configure email options. In the ‘System Notifications Recipient’ filed, make sure to enter an email address of the employee who will receive notifications for every new, deleted or expired registry and all the purchased gifts. If you don’t want to receive these notifications, set ‘Yes’ in the ‘Enable Notifications’ field. Specify email templates you will use for shared message emails and system notifications. To make use of templates, please, create them in advance. Don’t forget to select appropriate message senders, too. Go to System > Configuration > Sales > Sales > Gift Option to enable leaving Gift Messages on the Order Level and for Order Items. To let shoppers take advantage of the gift registry functionality, you need to create event types for your clients’ registries. Navigate to Customers > Gift Registries > Event Types in the admin panel to access the list of available events and add new ones. Hit the ‘Add New’ button on this page to create a new event. Enter the event type name in the ‘Default’ field. Please note that it will be displayed on the front-end. You can set different Event names for each store view, too. Admins can also manage display options of the event type on the front-end by specifying the sorting order and hiding the event from shoppers when needed. Once you receive the first notification that the gift registry has been created, you can go to Customers > Gift Registries > Registries to see the list of existing gift registries. Click the gift registry to see all the information about it. In the event details tab, the module displays general info: the customer email, event type, registry title and status, date, and so on. In the Items tab, admins can see the list of items included in the registry. Admins can change product settings right on this page. To access the settings, please, hit the ‘Configure’ button. All the orders related to the specific registry are shown in the Orders tab. The Aitoc’s extension grants merchants a chance to improve their customer service by sparing shoppers from the need to create gift registries by themselves. 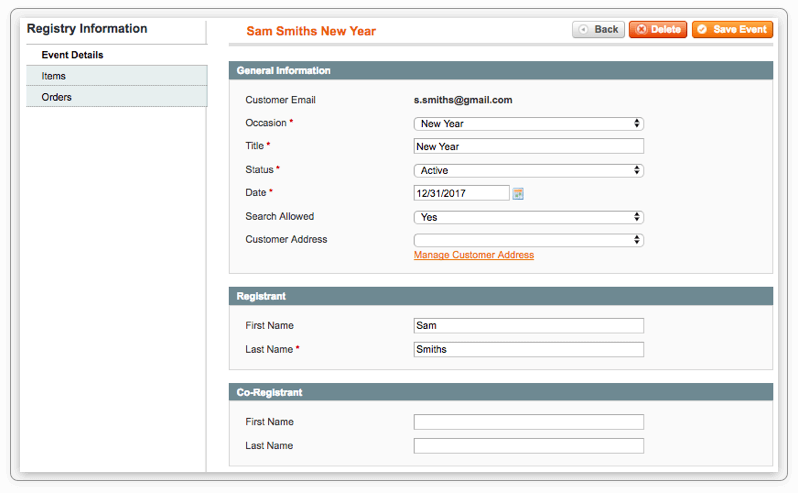 Clients can request a Sales Manager to create a new registry for them from the admin panel. Go to Customers > Gift Registries > Registries and click the ‘Add New’ button on this page. The extension will open the new page with the list of your store’s clients. Select the customer to proceed. Enter general info about the event in the ‘General Information’ section. Double-check the data for accuracy. Navigate to the ‘Items’ section to add necessary items to the gift registry. Click ‘Save Event’ button once you’re ready to activate the new registry. Now the customer can access the new registry from his/her account. 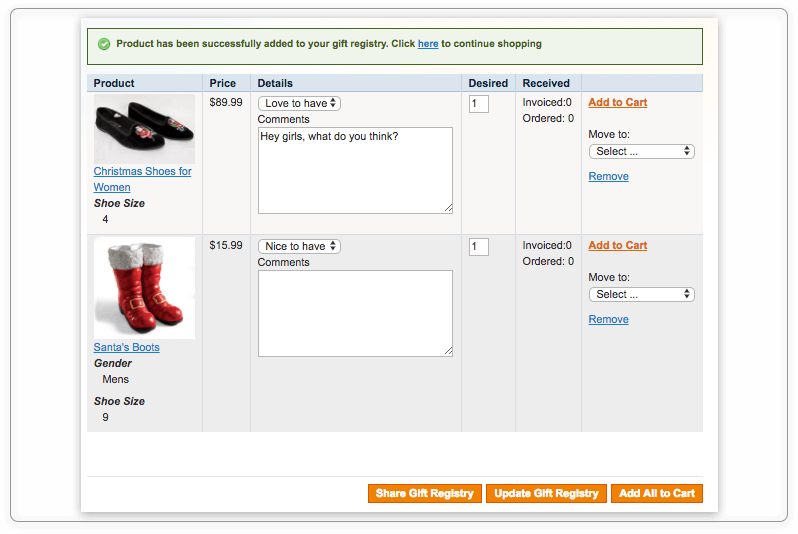 Shoppers can either search gift registry from any store’s page or from the dedicated Gift List Search page. 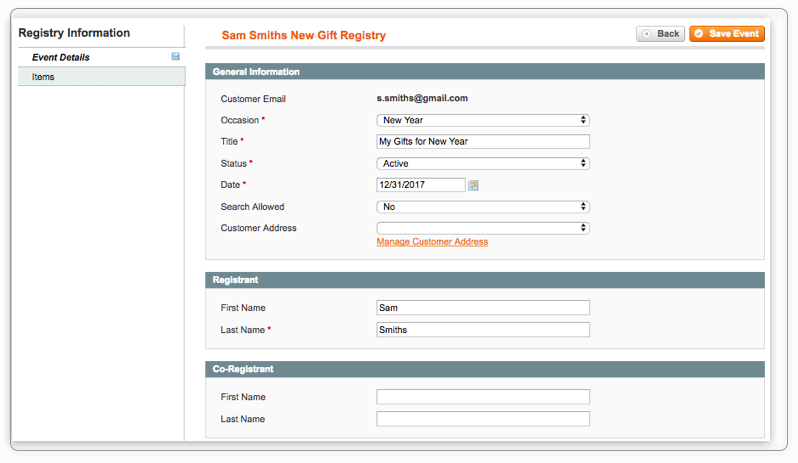 Registered users are allowed to create multiple gift registries in their accounts by clicking the ‘Create New’ button in the ‘My Gift Registry’ tab. 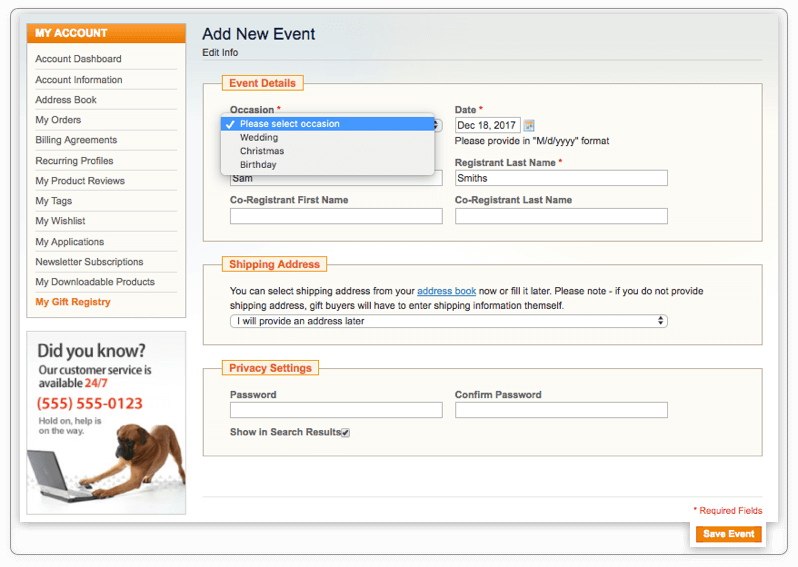 Select the occasion (aka the ‘Event Type’ in the back-end) and the event date, enter registrants’ names and specify the shipping address. Don’t forget to save the event to start using the new registry. Now you can go to the store to add required items to your registries. Once you click the ‘Add to registry’ option on the product and store page, you will be taken to the registry’s page. On this page, you can specify the desired quantity of items, remove items from the registry, move them to other registries, and add comments for each product. Hit the ‘Update Gift Registry’ to save the changes. To see which gifts from the list are already purchased, the user needs to access each registry separately and take a look at the ‘Received’ column. 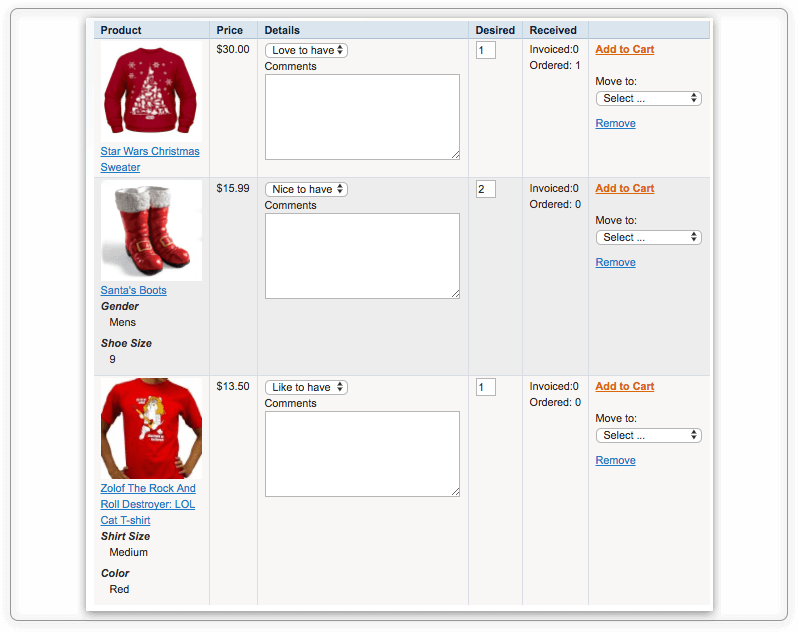 Users can buy all the items by themselves by clicking the ‘Add All to Cart’ button or share the registry with others. That’s how the Gift Registry extension works! Holidays are an extremely busy season for retailers and consumers. Help your Magento customers to tell their loved ones which gifts they want to get for this Christmas or any other event with Aitoc’s Magento Gift Registry.